“Baraja Carlos IV” fantasy deck by Félix Solesio, Real Fábrica de Macharaviaya, 1800. A rare example of a “de Corte” deck, that is, made for use by the Royal Court (see Fournier ESP 45), specially printed by Felix Solesio in the Royal Factory at Macharaviaya when, by Royal Decree and under monopoly, this establishment normally only made cards for Spanish overseas possessions. The design, as you see, varies between popular and more sophisticated models, but always within a “courtly” aesthetic, with pleasing details like the monkey, the elephant, and so on. Very likely this would be a courtesy gift from Solesio in return for the facilities and perks he had received from the Royal House. 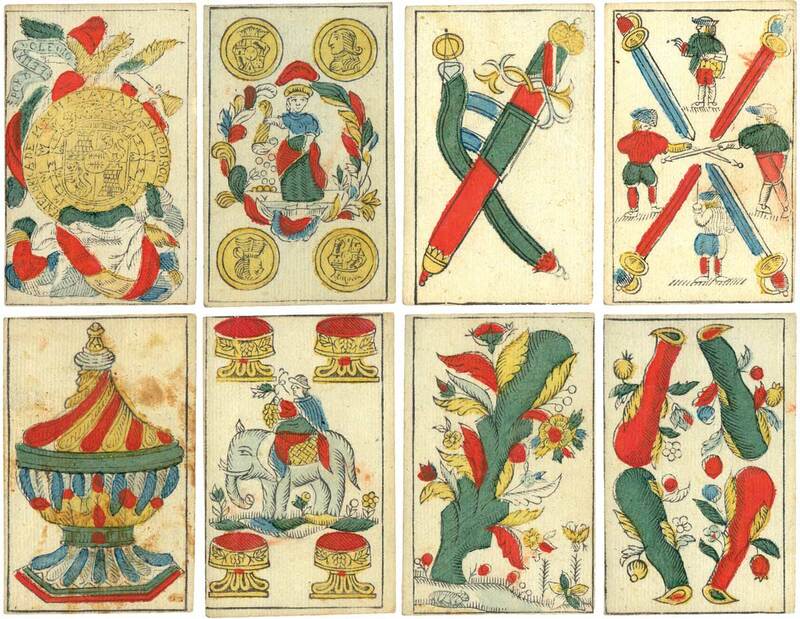 Above: “Baraja Carlos IV” fantasy deck by Félix Solesio, Real Fábrica de Macharaviaya, 1800. Above: three other copies are known: Cary Collection, SPA 52; Deutsches Spielkarten Museum, 1991-111; and one formerly owned by Sylvia Mann. In turn, there are two different models, with slight, but perceptible, design variations. 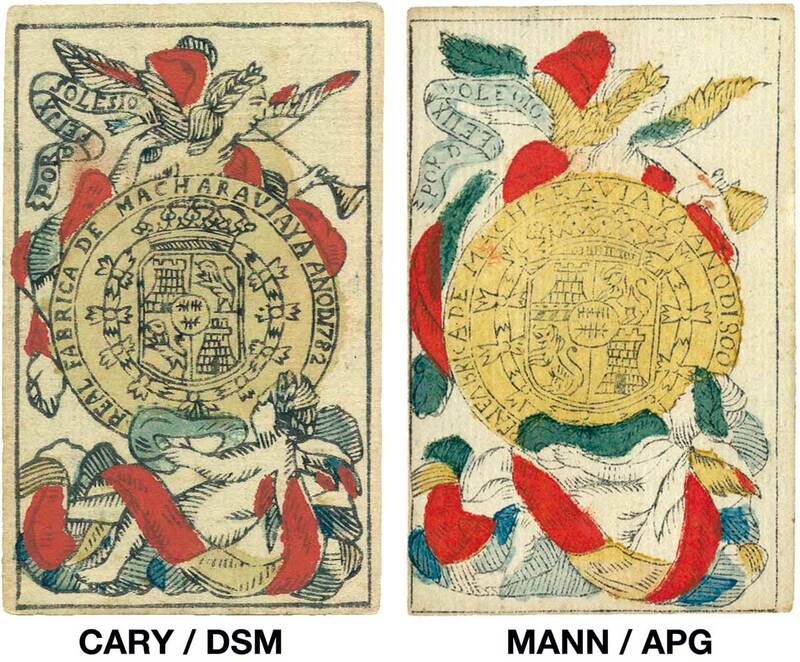 The Cary example (reverse white) and the DSM deck (reverse floral, lacks two cards) have “pintas” (border breaks); dated 1782 on the ace of coins and 1800 on the two of coins. The Mann copy (reverse same as DSM) and AGP (reverse lines and dots) do not have “pintas”. Dates include 1800 on the ace and two of coins of Mann copy, and 1800 on the ace of coins and 1801 on the two of coins of AGP copy. Thanks to Alberto Pérez González for images and research. In 2006 Alberto Pérez published a limited reproduction of this deck, based on the DSM copy, for Maria Bellezza Bussi, descendant of Solesio.